56 is a composite number. 56 = 1 x 56, 2 x 28, 4 x 14, or 7 x 8. 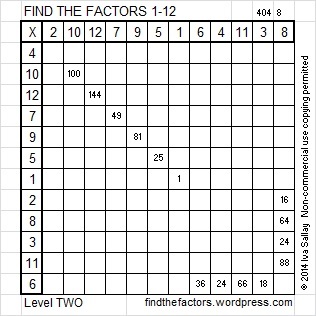 Factors of 56: 1, 2, 4, 7, 8, 14, 28, 56. Prime factorization: 56 = 2 x 2 x 2 x 7, which can also be written 56 = 2³ x 7. 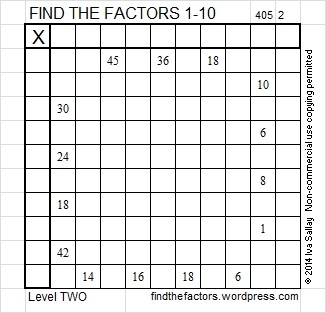 Sometimes 56 is a clue in the FIND THE FACTORS puzzles. Even though it has other factors, the only multiplication fact we use is 7 x 8 = 56. Glad to have the answers for last week’s; the 404C puzzle was driving me and a friend crazy. Also I’m glad to have got it right. Those level 6 puzzles can be a challenge. Good for you and your friend for sticking with it until you got it right!